This ravishing collection showcases the extraordinary beauty of Jane Edwards' voice and the brilliance of harpist Marshall McGuire. 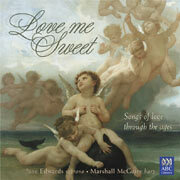 Included are some enchanting early English and Italian songs, several delightful 20th century English folk and art songs, three 19th century German lieder and two French classics by Reynaldo Hahn, all brought together and united by the accompaniaments which are all arranged by Marshall. Not to be forgotten is the contribution from Australian composer Carl Vine whose Love me sweet was first performed by Jane on the soundtrack to the television mini-series "The Battlers". This album was recorded in the superb acoustics of a convent chapel utilising the Artworks state-of-the-art Direct-to-disc process. It was originally released on the Artworks label as catalog number AW019.